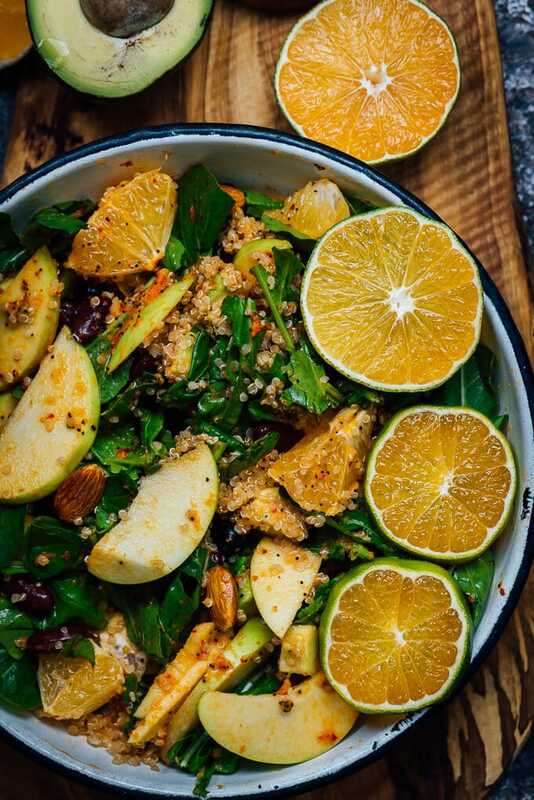 This Vegan Quinoa Salad is made with arugula, avocado, black beans, almonds, apples and oranges. A perfect side dish to accompany fall dinners or a satisfying light lunch. 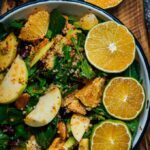 This power packed salad is definitely an immune system booster with the help of all ingredients and its super healthy orange poppy seed dressing. This vegan quinoa salad makes a wonderful lunch as it is packed with protein-rich ingredients. Besides black beans and quinoa, I also use raw almonds in this salad to make it extra nutritious. 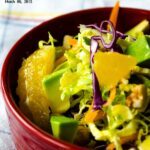 Everything in the salad is there to make a unique combination of flavors that satisfies taste buds while strengthening immune system. 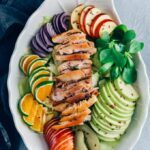 All ingredients in this salad help you stay healthy, which we all need especially on these chilly days. Bursting with flavours and vitamins, this salad is the ultimate vegan salad for fall. You know apple and orange are in season now. Why not use them in a super healthy salad like this? They give an amazing flavor and succulence to the salad. 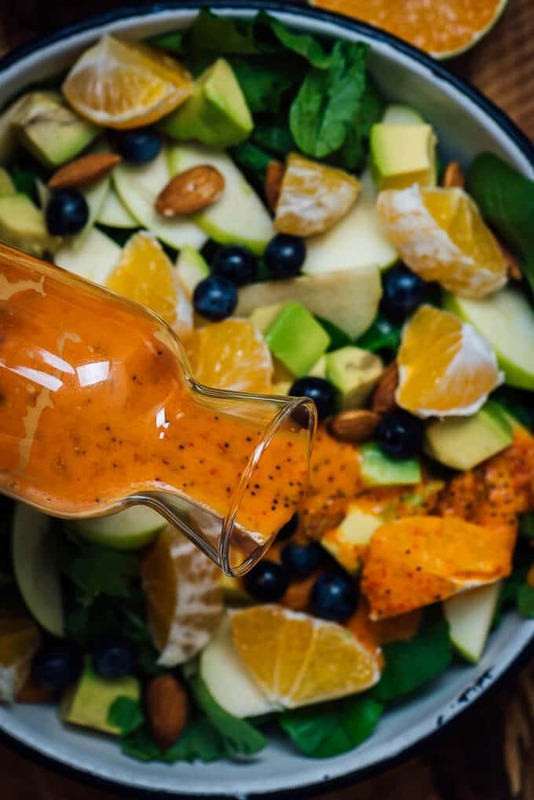 Plus, the Turmeric Orange Poppy Seed Dressing is like a magical touch on the salad. It gives an extra refreshing feeling in the salad but I recommend you to use it right before serving as it is an acidic vinaigrette. I always love preparing salads with various combinations of veggies and fruit. The richer a salad looks, the more attractive your dinner table becomes. That’s why I use lots of foods with different colors and textures in a salad and this vegan quinoa salad is no exception. 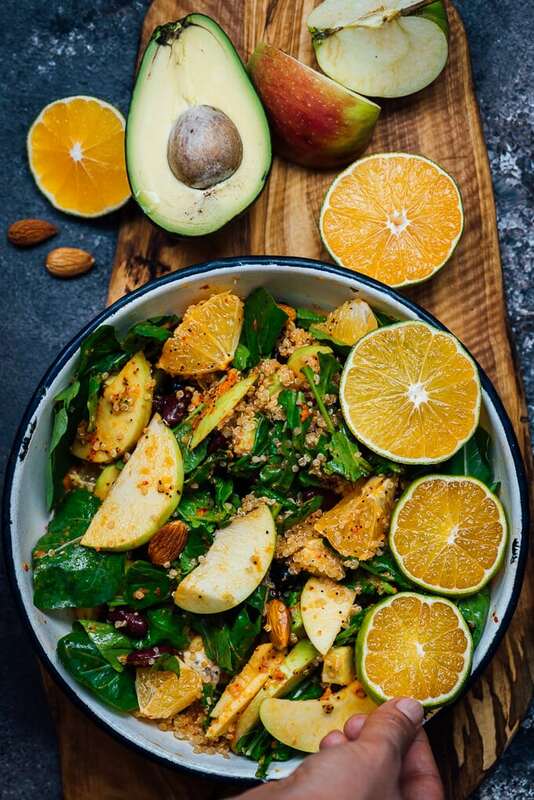 Besides quinoa, the super ingredients in this recipe are black beans, avocado, apples, oranges, almonds, blueberries and arugula. Arugula, apple slices and almonds give the salad a lovely crunchiness. Quinoa and black bean are wonderfully balanced with the rest of the flavours. Although it’s not the main ingredient in this salad, avocado has a key role here. It helps other flavours stand out more. In short, you can add whatever you have as healthy in this salad. Sky is the limit. 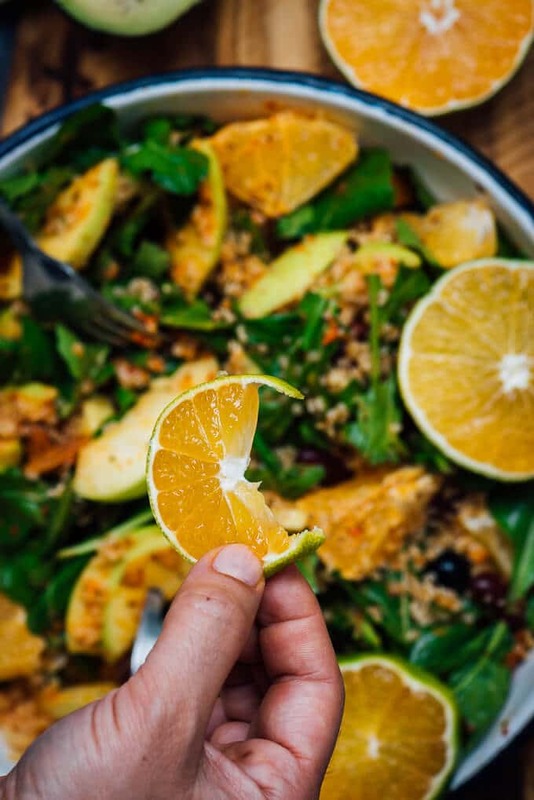 Also, I use turmeric orange poppy seed dressing over this tasty salad which definitely takes it to the next level. I suggest that you check out our Homemade Vegan Salad Dressing Recipes if you want to see more options to enrich your salad. This is a great salad for almost everyone. I’m sure those following vegan or gluten-free diet will enjoy it a lot. They can even have it as the main course because it is a very satisfying salad and you wouldn’t need anything else to pair it with. Want more fall salad recipes? Check these out! A very light and crunchy vegan salad that is packed with protein and vitamins. Cook quinoa in a medium pot with 2 cups hot water on the lowest heat. Let it cold. In a large bowl, combine everything except the dressing. Drizzle 3 tablespoons dressing over the salad before serving. Hi Zerrin, vegan or not, it is perfect time of year for all of us to start packing vitamins in, right ? I am crazy about turmeric and this idea is perfect combination of flavors for work lunch. Thank you ! Glad to hear you loved my salad. Salads don’t have to be boring, right?